Thanks to Global Influence for this sponsored post giving me the opportunity to share my experience with Simple® skincare products and share details of #Saturdate with Beauty. Simple® Skincare is one of my absolute favorites and the cleansing cloths have changed my life! I attended a favorite things party a while ago. You bring your favorite items and share them with friends. One of the items I brought was Simple® cleansing cloths. They are the perfect solution for my lazy bedtime skincare routine. I use them to remove makeup and it's gentle and effective enough to remove eyeliner and mascara around eyes. They are also fortified with Pro-Vitamin B5 which helps to restore, soften and smooth skin. I really love how natural and effective they are for use on my very dry, sensitive skin. They are also free of heavy perfumes and don't further dry out my parched skin. Bonus: They are a great item to have in your purse during the summer to use as a quick cool down on really hot days. 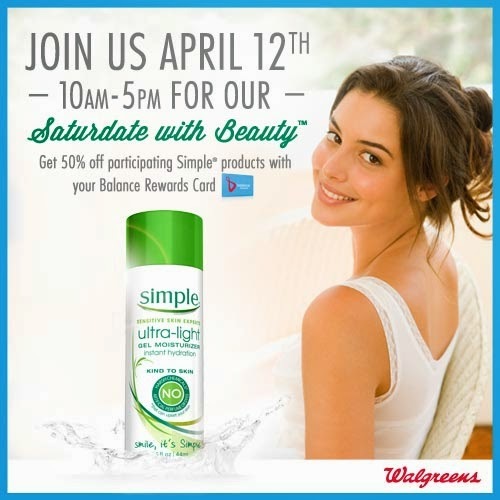 Join in the #SimpleSaturdate Walgreens Twitter party with @ResourcefulMom to learn more about what Simple can do for your skin. RSVP for a chance to win 1 of ten (10) $50 Walgreens gift cards. Would you like to give Simple® a try? Join them for a Saturdate at Walgreens where you can learn about the complete line of paraben free, no dye, no artificial perfumes or irritants products. Beauty experts will be on hand to address your personal skincare needs too. Also, sample the new Ultra Light Gel Moisturizer for instant hydration and the 24-hour Nourishing Cream for super soft and smooth skin. 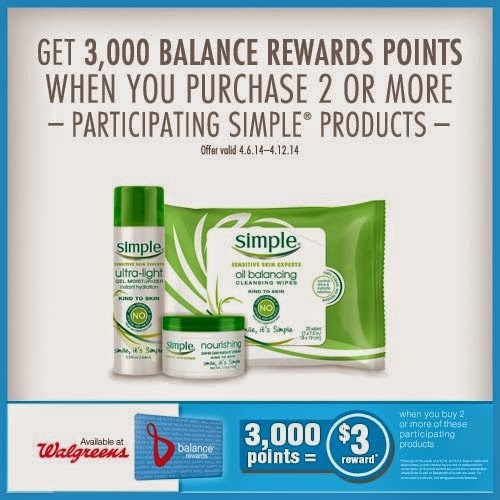 Buy any 2 or more participating Simple® products at Walgreens now through 4/12/14 and get 3,000 Balance Reward points. 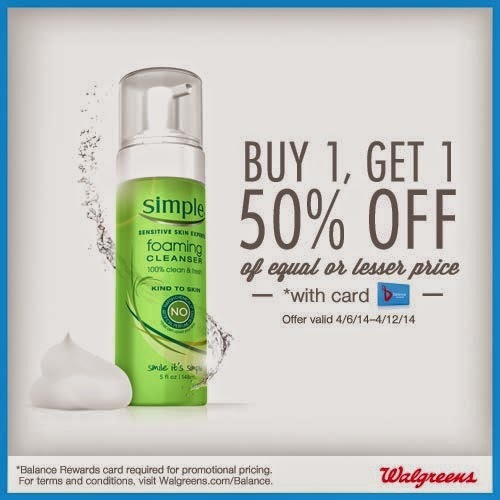 When you buy one participating Simple® product at Walgreens, get the second 50% off with your Balance Rewards card. Are you a fan of Simple®? Well that is not a bad deal at all! My skin has been particularly dry on my cheeks lately and it really shows with mineral makeup. I have sensitive skin too so I'll give it a try.